What activities are you looking forward to doing during your visit to Japan? Well, if you’re interested in learning about Japanese home-style cooking, that’s exactly what we can offer you: a friendly class in English and Japanese where you can learn how to prepare some popular dishes. It’s a chance to produce genuine examples of ‘Mom’s cooking’ which no restaurants in town have on their menu. This program starts with preparing sushi rice and cooking it in an earthen pot and also making sushi vinegar. Cutting up fish to serve raw as sashimi or filleting small fish into pieces, you can enjoy a “hand-rolled sushi party”, an experience restaurants don’t offer. Our aim is to offer overseas visitors the chance to experience the Japanese lifestyle while enjoying preparing and cooking themselves…and eating the results! 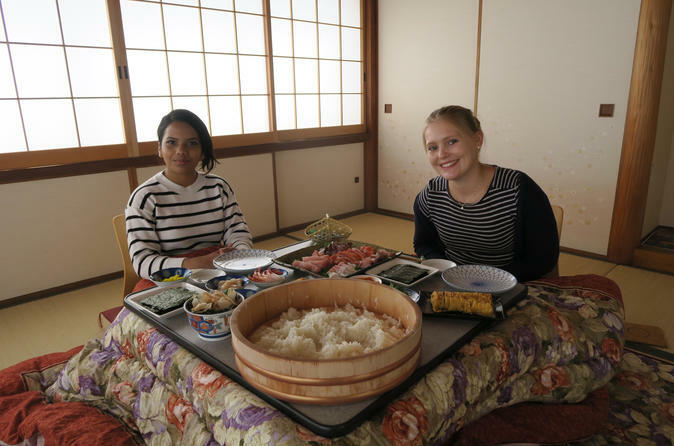 After all the fun of preparation and cooking, it’s time to taste the dishes in a charming tatami-matted room. There’s no need to worry if you can’t kneel on the floor in the formal seiza position, because we provide tables and stools as well! Please visit Cook JPN in Asakusa. We’ll be happy to provide you with a memorable experience of the traditional Japanese daily lifestyle and sincere hospitality.